We take as our starting point, the title of Stuart Hall’s essay, ‘What Is This “Black” in Black Popular Culture?’ and ask our panelists to consider Black. Popular Culture in their lifetime, in their work and in other’s work, that they engage with . What we need to consider for the future – working outside the rest of Europe ? Hall’s essay was published 20 years after we’d been in this space, now we need to consider, 23 years after he wrote it, where are we now and where do we go from here. Establishing the cultural frameworks to enable the discussion and to explore the Black dynamic theory and practice. Conference 1 will aim to lay the theoretical and critical foundations, which will help to frame and form the basis of discussion for the ongoing series. The panel symposium consists of arts practitioners, activists, theorists and artists from UK covering Cultural Theory, Music, Style (with a focus on hair) and Idols and Icons. 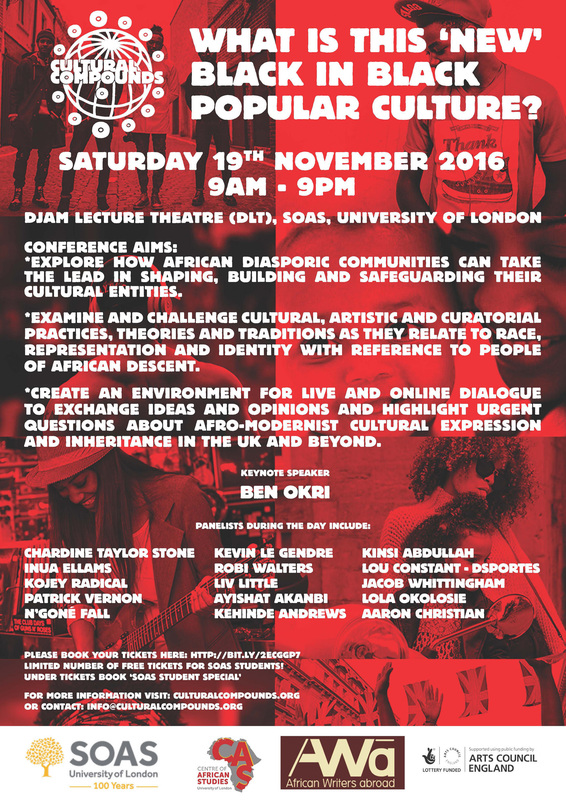 All themes will be interpreted broadly and include questions on race, place and identity for artists of African descent in Europe. Explore how the cultural, political and the personal relate to current representational practices and our knowledge of the past and contribute to our aspirations for the future. Examining and challenge artistic and curatorial practices as they relate to the cultural politics of skin colour, race and representation with particular reference to people of African decent and the arts. Discuss what is currently accessible and how do we make it accessible for modern black/African identities to engage on an equal par?